Discover the natural beauty and charm of the Gold Coast hinterland! When you think about holidaying on the Gold Coast you think beaches, sand and theme parks however the Gold Coast hinterland features a range of natural treasures like national parks filled with wildlife, rain forests and spectacular waterfalls through to a stunning variety of arts and crafts plus boutique wineries and award winning restaurants! In a stark contrast to the typical golden sands and hustle and bustle of Surfers Paradise Mt Tamborine offers a peaceful, relaxing and tranquil environment perfect for that holiday escape! Views of the Gold Coast from Mt Tamborine! Here are 3 attractions and reasons why you should visit Mt Tamborine. Walking tracks are provided in six sections of Tamborine National Park. Most walking tracks are short and can be walked within a few hours. 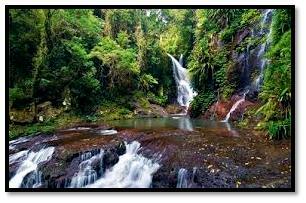 Discover amazing waterfalls and rain forests on your walks through the national parks at Mt Tamborine! 2. Mt Tamborine Shopping – The famous “Gallery Walk“ boasting over 60 art, craft, gift and nick-nack shops lures thousands of visitors to Tamborine Mountain every year! If you are after something unique and special – chances are you’ll find it on Tamborine Mountain. 3. Mt Tamborine Food and Mt Tamborine Wine – Locally-grown produce including avocados, kiwifruits and macadamia nuts, alongside award-winning cheeses and the mountain’s mainstay – decadent fudge – lend themselves to some seriously good eating. With quality food comes the need for a quality drop, and as Queensland’s fastest growing wine region, Tamborine doesn’t disappoint, boasting 7 wineries offering a huge variety of wines – whites, reds, sparkling, fortified and everything in between. Add to that some fantastic beers from the local brewery “MT BEER” and spirits from the world-famous “TM Distillery” – and a unique and exciting tasting experience awaits you on Mount Tamborine! 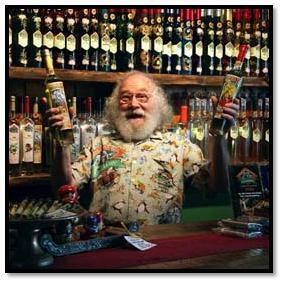 Enjoy the friendly atmosphere and tasty schnapps at the TM Distillery! Jackie: My role as a Project Coordinator is to support the WorldMark Owner Education team. I also help to create and design educational material that assist Owners in understanding their Ownership better. I will be focusing on explaining how to use your Ownership, how to get away holidaying more regularly and to clarify any of those tricky questions. I recently moved to the area and have been looking for places to explore. Thankyou. Will have to check out those walking trails! Jacqui – great. Thanks. Heading to Kirra in October so I’ve downloaded your comments and will check out some of the points when we’re there. Thanks again.